lI’m chugging kale in a San Francisco juice bar, contemplating an aching heart and Joe the hugger in Montreal. He’s the wise man at my café, who the tough guys are nuts about and heave-ho their lumbering bodies to embrace. I eyeballed Joe for months before I wrote a word about his telekinetic hugs. We’re pals now. I can usually feel the moment he slips into the café, before the shout of his name, and I jump up and run over, first in line, for the power surge of his arms. But the other week, I was snared in my own drama, and didn’t notice he was there, until he was inches away and my nose smelled his cigar. My mouth dropped and my brain screeched to a halt. I had wanted to tell him everything, but suddenly, all the words were gone. Joe smiled. He said that if we fight or resist a bad feeling, if we ignore or push it away, we give it more power. As it sank in, my soul transposed into a deeper key. Weeks later, I’m still thinking about the practice, referring to it, asking everyone I know. Are you upset? Are you angry, sad or scared? Doesn’t that make you feel free? As I get older, I’m learning more about how to let things happen, and then, miraculously, my people, how to let them go. Joe was there for the births of John’s 4 kids. 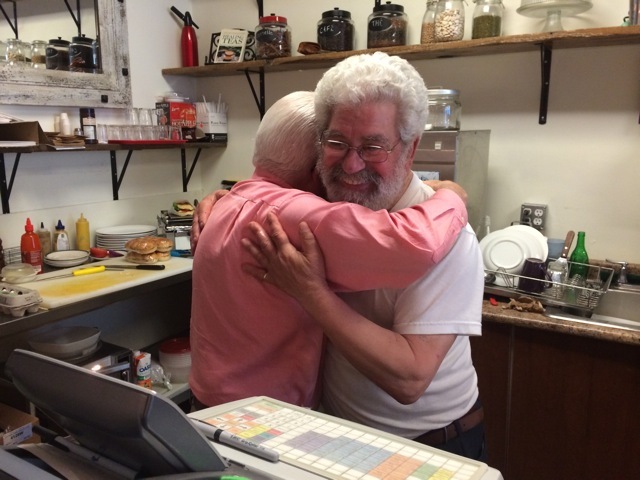 John, the much-loved owner of our melting pot café, has known Joe forever and explains that his central message, what he really means to say, is that no matter what is going on with your life: it is and, despite what you think and feel, all is well. Joe doesn’t want you to see him. He says he doesn’t matter. 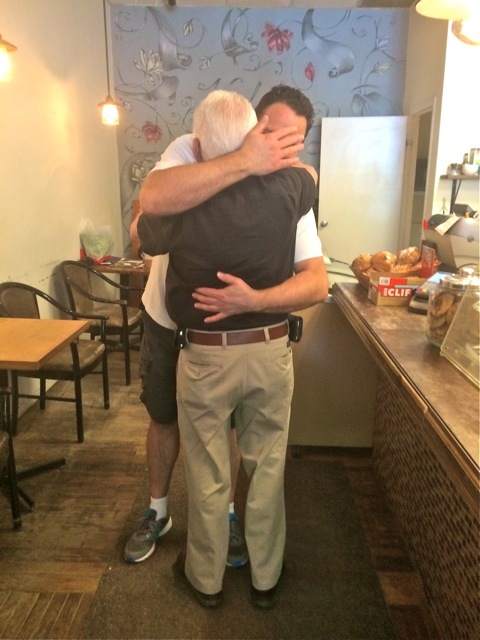 But I am thankful that he, John and some generous regulars have granted me permission to photograph and show you his hugs. Read more about Joe in – My Café. FAN THE FLAMES: In my last post, I told you how I aim to make a living with my blog. I asked you for a donation of any amount, if and when you feel the urge. I cannot thank you enough for your generous, deeply touching response… you fill my heart! GOOD NEWS FLASH: I have one word for you: PRIDE. 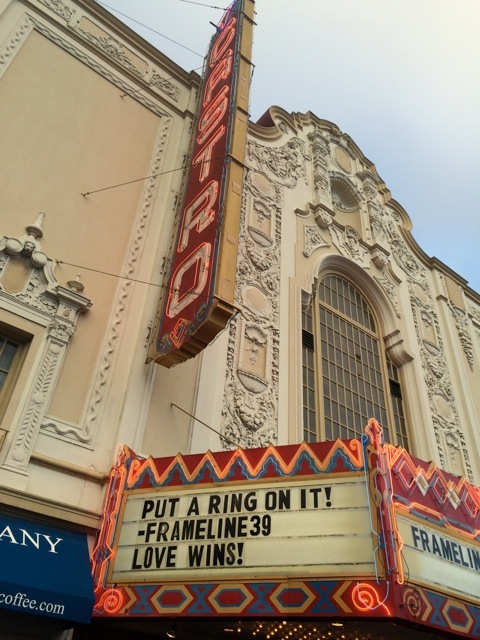 I was in San Francisco to celebrate the historic, about-time Supreme Court decision on legalizing Gay Marriage in the USA, with the masses. All together now!! Thanks to my fantabulous, new collaborator Nicola (more on her soon), my post Gabriel Garcia Marquez Saved My Life was posted on Gabo’s Random House page on Facebook and has amassed hundreds upon hundreds of shares and almost 10K likes. Gabriel Garcia Marquez is dead, long live Gabriel Garcia Marquez! 44 Responses to Do You Need A Hug? Beautiful words to add to the mix. Thanks, Ez! 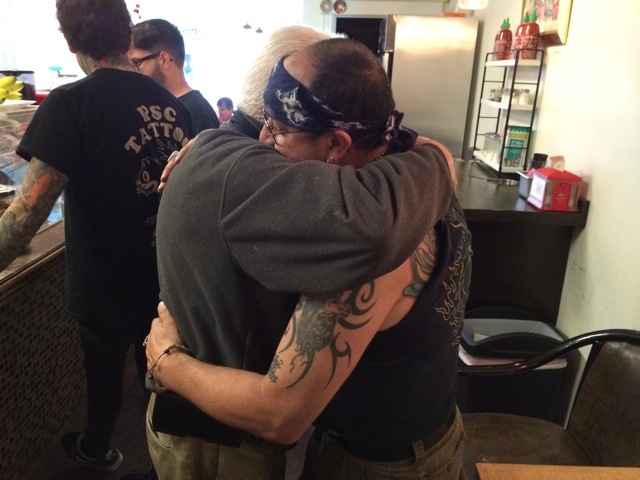 The power of hugs and letting go are such positive ways to live your life. Thanks for the reminder. Luckily, I’ve stayed out of the drama vortex. I realize sometimes it comes knocking anyway. Drama lurks in our dark corners. That’s the totally scary part about life…. Nice to hear your voice! This is a great post. Allow. Fancy that. He is so easy to love. He allows it. I LOVE this mantra of “Allow it”! I married a hugger. Each year at graduation he hugs every single graduate in their white dresses or blue blazers. It’s a revelation. Joe won’t tell me how he became a hugger, except that when people hug him, they are hugging themselves. I’d love to talk to your beautiful man and see what I can dig up. Thank you, Jen. Thanks! Joe is happy to share. Oh, how we need more Joes in the world! I am going to totally borrow his “Allow it.” I’ve been saying the same thing for years, but not as succinctly or beautifully. Bravo! And… Whoa! Whooooa! Nearly 10k likes is epic! Hugs for everybody. I read somewhere that hugging is actually supporting your health. Thanks for sharing. We all need a Joe – or to BE a Joe! Love this! That’s exactly why I had to share his good word. Lovely to see you here, Irene. Holding on to coal just burns your soul. Let go of all, that makes you feel low….and never forget the power of a hug. It’s so much while being nothing at all. Thanks for the reblog, and welcome. Thanks to you too. It was a great read. The power of simple words and hugs… You put it really beautifully there..
Hugs are important in today’s harsh age! Its amazing that there are awesome people like Joe out there who spread positivity! I couldn’t agree with you more. Who are we going to hug next? I don’t even know Joe, and I love him. This is one of the sweetest things I’ve come across today! Allow it, good thing to remember. Please check out my blog everyone! Thanks a ton! I will happily pass on your love to Joe. Just read this out loud to my roommate who’s feeling the ache of a broken heart, and it was perfectly appropriate. Thank you for this reminder. Hugs! Hugs right back at you. How I love that you read this out loud. Thanks for the hug and lovely words. I promise to pass them on to Joe. Welcome to BTF, Bini! So nice to have you here. Right back at you! Welcome, Sam. What a lovely thought and inspiring story. Thanks! We aim to inspire. Thanks and welcome to BTF, Bidy! Thanks for this beautiful post. Your words and Joe’s words are just what I needed to read today. Thank you! We all need a Joe in our lives! Thanks, Rissa and welcome to Burns the Fire.